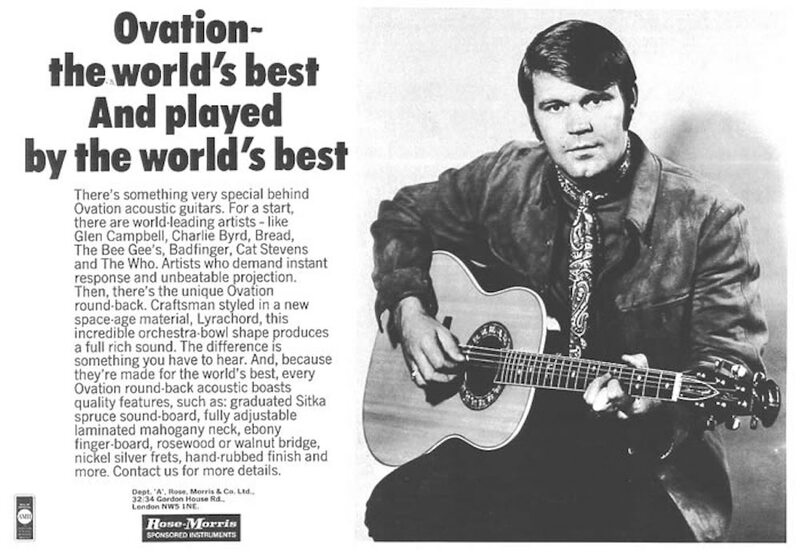 Ovation guitars deeply influenced the American music in the last quarter of the Twentieth Century. From 1966 to 2007 Ovation guitars has been a brand of KMC Musicorp, a subsidiary of Kaman Aircraft founded by Charlie Kaman. In 2008 KMC Musicorp (therefore Ovation brand) was sold to the Fender Musical Instruments Corporation. In a January 2018 post on the Facebook page Ovation Collectors group, mr. Bill Kaman himself described the story of Ovation, from his departure from the company to the sale to FMI: “[When I left] KMC was run by a Financial man by then who was on a short leash from the corporate [snip] bean counters. They eventually squeezed the company so tight that it looked really good on paper and then sold it to Fender who needed it for their IPO. The IPO fell on it’s face and Fender then blew the whole thing up as they tried to salvage themselves as Fender. They sold it [snip] in 2007 and by then Charlie had been in the home [ndr nursing home] for 5-6 years so the bean counters had their way with Music. They killed his baby”. After the the IPO withdrawal, Fender started the demolition of this half a century old intellectual work of art, which culminated in the shutdown of the historic facility in New Hartford, CT on May 31, 2014, 48 years after the inauguration. After producing one last guitar, the historic plants of New Hartford were finally decommissioned and 46 employees (mostly valiant Ovation master luthiers who had also produced some magnificent acoustics for Fender, Guild and Hamer) fired. 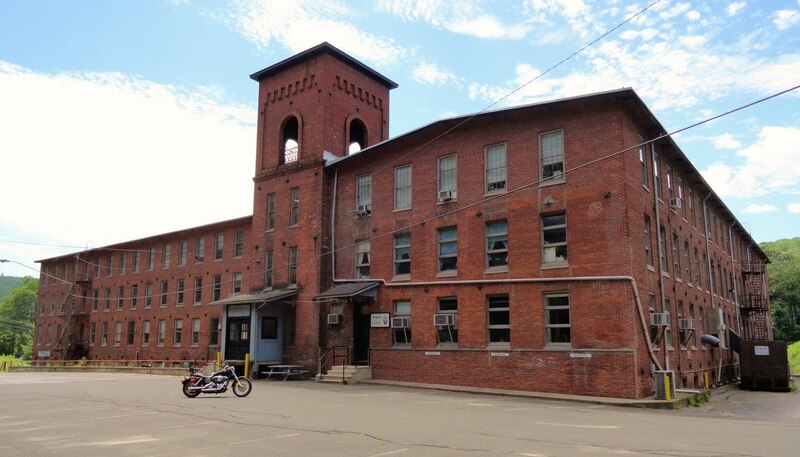 June 2015 brought some apparently good news: after acquiring the Ovation brand from FMI, the drum company DW Drums Inc. signed a new loan contract for some space in the old New Hartford, CT building. 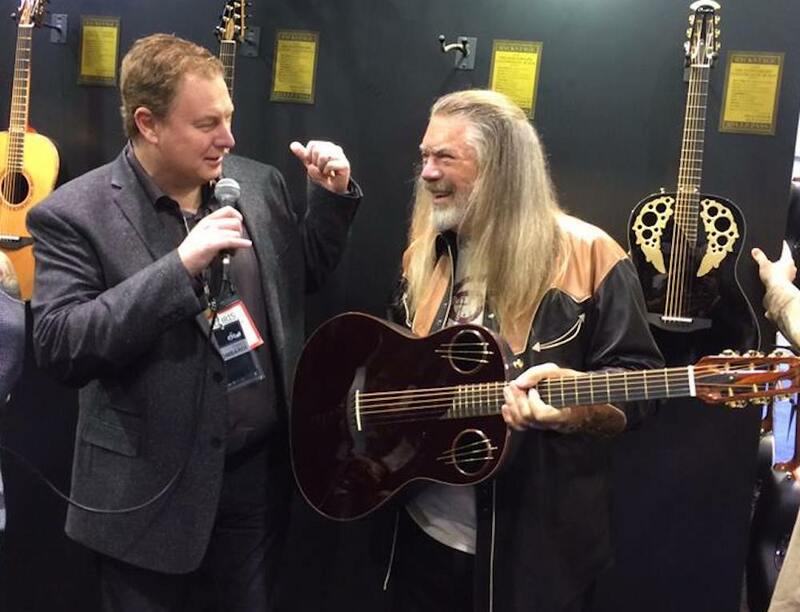 In this picture Chris Lombardi, CEO of DW Drums, gives one of the first commemorative Adamas 1198 AV-40 to Bill Kaman at 2016 NAMM. It appeared as the beginning of a new and prosperous era for Ovation, but after the 2018 Summer NAMM – where DW unveiled a questionable line of depersonalised guitars – a press release dated August 3, 2018 announced the shutdown of the American production: “Ovation New Hartford, CT facility will cease operations to clear the way for the brand new direction”. At January 2019 Winter NAMM an all-wood, Baggs amplified, flatback guitar made in California appears at the Ovation stand. The Ovation fans community is not happy and consider this guitar the final grace stroke for the glorious and innovative American brand. 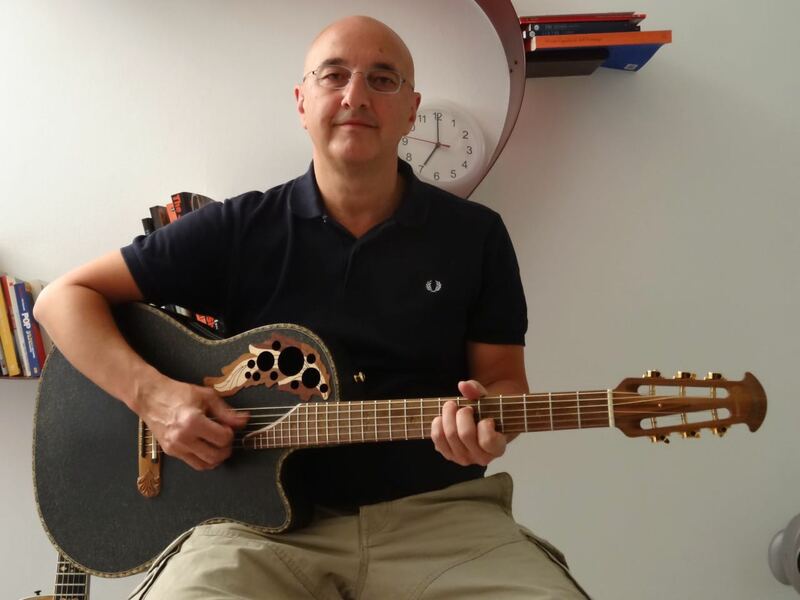 This opinion of Paul Templeman summarizes hundreds of negative comments: “if I want a conventional, or even unconventional all-wood guitar, then I’m spoilt for choice just in factory built or small shop production. When you start looking at individual luthiers the choice is even wider. If I want something that sounds, plays and behaves like a USA Ovation then there is only 1 choice, or at least there was. It’s really quite insulting to the legacy of the brand that the main USP has been ditched and a unique design just becomes yet another Martin wannabee. And while I like Baggs products, the original Ovation pickup is still a benchmark. Style over substance, marketing rhetoric over testicular fortitude”. On the other hand, Damon Thomas, a well known Ovation Dealers, is positive on the value of the project: “It’s no marketing ploy. From the beginning Chris wanted a wood guitar. Good wood is what the parent company is all about, and they’re the biggest and best drum company in the world when it comes down to it. It’s really all about the guy who bought the place. It was his call/dream, not the marketing pukes. As hard as I tried, and even being the first to order, there was no prying #1 from his hands. I even saw a picture of the thing in the hotel room, headstock on a plush pillow, tucked under the covers in bed. It’s obviously a personal thing for him”. February 2019, here I add my 3 cents after reading any available information (no way to get my hands on the real thing, I am afraid that the Italian distributor will never receive one). Cent 1 of 3: in my opinion DW Drums never planned a solid strategy harmonic with the values of the brand summarised by the classic top of the line American models. In a matter of four years DW reopened the mothership facility, → presented a line of products respectful of the tradition (forget the electric Adamas please), → got rid of the Ovation headstock for the top of the line models, → announced the end of the American production, → announced a guitar made in California → reintroduced the Ovation headstock but in a non-roundback guitar. I understand that running a guitar company is not easy, but isn’t this strategy a bit schizophrenic? Cent 2 of 3: there’s millions of very good all wood guitars out there, there is only one roundback. Musicians looking for a wood guitar have a tremendous choice of traditional guitars, from cheap Chinese cigarboxes to fancy Collings, Gibson, Matin, ranging from 100 to 100,000 bucks, with any choice of preamp systems: they do not need an Ovation wood guitar, with weird (in their opinion) headstock and soundholes costing as much as a good Gibson. On the other hand, some musicians like the Ovation guitars for their look, roundback and amplification system, so there’s no chance that they will be interested in an Ovation-wannabe wood guitar . Cent 3 of 3: Ovation is not anymore as desired by the young musicians as it used to be at the end of the last century. Today the competition in the amplified acoustic guitars is tougher than ever. Al Di Meola, Glen Campbell, Richie Sambora, Melissa Etheridge are not bringing sales anymore. In a nutshell my opinion: why not investing in a defined marketing strategy, aimed at giving the Ovation brand allure to new generations of musicians?